If you're in the market for a new smart TV, it's going to come running an operating system - just like your laptop or your smartphone. To help you pick apart the differences between the major players, here's a rundown of each one's advantages and disadvantages. Simply put, the TV version of Android, so you know you're going to get a good selection of apps - though developers need to write specific versions of their apps for the big screen, so you can't just install any Android app you like on your television without a bit of hacking. The likes of Netflix, Plex, Spotify and the VLC media player have Android TV apps available - click here for a current list. There's even the opportunity for some light gaming. What's more, a recent update ensured that any service hosting 4K content will be able to display Ultra HD films and programmes on compatible TVs, and voice search is also heavily integrated into Android TV so you can just ask to view "award-winning dramas" if you need some inspiration for what to watch. It's fair to say Android TV is still very much a work in progress, and some of the features we've seen Google preview - like picture-in-picture functionality - have yet to roll out to actual TVs. Still, with the might of Mountain View behind it, Android TV is a good bet if you want something as future-proofed as possible. Oh, and Android TV devices can also work just like a Chromecast, letting you beam content to it from your smartphone or tablet. Firefox TV - simple, stunning, but on the way out? A joint offering from Panasonic and Mozilla, Firefox TV has a lot going for it - plenty of useful apps, a clean and fresh interface - so it's a shame that the platform seems to be on the way out as of the end of 2016. Mozilla has decided it wants to focus its attention on the Firefox browser rather than any other projects, which means no more coding time for Firefox OS. From this point on, it's down to Panasonic to keep it going. That's a pity, because with its interface of colourful, pop-up icons, stretched across the middle of the screen in a dynamically responsive carousel, this is one of the best smart TV operating systems we've had the pleasure to use. It's simple but effective stuff, with icons for apps, devices, inputs and specific TV channels all presented. It's also by far the easiest smart TV interface to customise, as apps or services can be 'pinned' to the carousel in seconds. 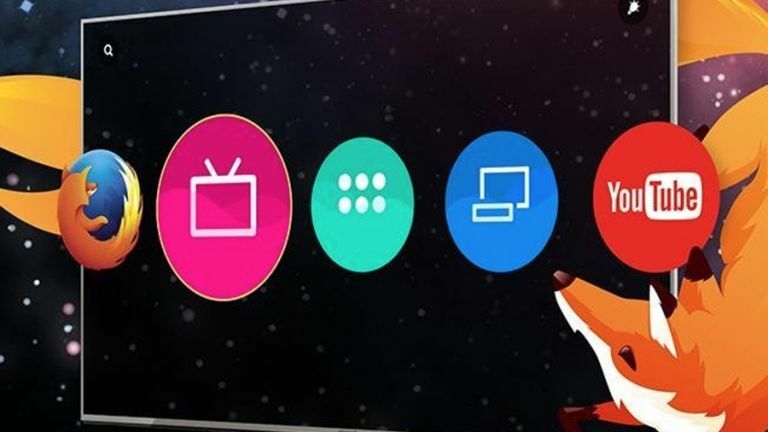 Apps such as Netflix, Amazon Instant Video, YouTube, AccuWeather and iPlayer make Firefox OS a decent choice - and Freeview Play is integrated as well for UK users - but with no word yet from Panasonic it's unclear what the future of the OS looks like. Samsung has never been afraid of going it alone and now puts its own Tizen TV operating system on every smart TV it makes (a variation of the OS that also appears on Samsung's smartwatches and some of its phones). As with Android TV, Tizen has its roots in smartphones, although right now you're more likely to find the big-name developers on Google's platform rather than Samsung's. Looks-wise, it's actually quite reminiscent of webOS (see below), with big, bright icons and shortcuts making it look great on screen and enabling you to find your way around easily. Cleverly, the Tizen interface monitors what you watch and the apps you use, and suggests new sources, as well as enabling some customisation (a dynamic 'Recent' box in the corner cycles between recently used apps, TV channels and more). The chance to customise the on-screen icons is a definite highlight here, with a sense of permanence welcome when it comes to the AV inputs and key apps you use every day, and the Samsung apps includes mosts of the big beasts (iPlayer, ITV Player, Netflix, YouTube and Amazon Instant Video). With the arrival of webOS in 2014, LG's smart TV offerings were completely refreshed, and there have been several solid updates since then. Today's webOS 3.0 software is built around a taskbar that runs along the bottom of the screen. All apps, whether a content hub such as Netflix or simply an HDMI input on the TV, are treated the same on the dynamic display, which sees icons pop up, jig about, drop down and change order. It's fast – really fast – which is a great improvement over older smart TVs, although it does lack some of the easy customisation you get with Firefox TV and Tizen. Far from being overshadowed by the bigger names in the OS-making department, LG has put together a television platform that's fun and fast and simple to use, and while it might lack some of the broader ecosystem apps that Samsung and Google can offer, all the key video apps you need on your TV are here.